Last week’s post covered why low PIM components, other than coaxial cables and assemblies, can be important to consider for low PIM applications. This blog focuses on low PIM Directional Couplers, Loads, Attenuators, Adapters, and Antennas, and provides brief descriptions of their use cases and value. Unlike tappers, splitters, and dividers, directional couplers are precision designed to only pull a small amount of power from the main transmission channel to the coupled port. Typically, directional couplers are used for sensing, monitoring, feedback, and low power taps. As a directional coupler is generally used within the transmit signal chain, and this naturally introduces at least two additional connections, using low PIM directional couplers could help reduce the number of potential PIM generators in a system. Attenuators and loads are used either in-line or as terminators, respectively, to reduce RF signal strength before sensitive components or to prevent signal loss or reflections generated by unterminated ports. Attenuators introduce two additional connections in a signal chain, and low PIM versions can be useful in reducing PIM if the attenuator is in-line to an antenna. Where loads aren’t in-line to an antenna, they may be used to shunt a substantial amount of RF energy, and can be a PIM generator if any impedance imbalance leads to reflections. This is particularly undesirable in bi-directional communication systems where any distorting reflections could be fed to the receiver. Hence, low PIM loads are also a viable component in reducing PIM in select system designs. 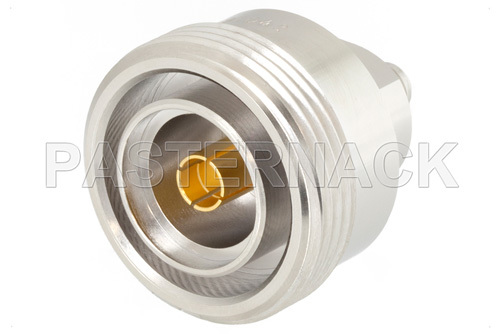 Though the best way to avoid PIM with coaxial connections is to reduce the number of connectors needed, if adapters are required between dissimilar coaxial connectors, using low PIM adapters can result in less distortion energy if properly used. Moreover, there are low PIM right-angle adapters that may be able to actually reduce the number of connectors needed in dense and space constrained applications. Low PIM right-angle connectors could be especially useful when installing or troubleshooting corrugated coaxial cables, as these type of cables are often used for low PIM applications and can be difficult to form in tight spaces. As the metallic connections within an antenna can also generate PIM, low PIM antennas can be a viable option in mitigating antenna related distortions. These antennas come in multi-band configurations, often operating from ~700 MHz to ~ 3 GHz, to accommodate frequency bands used by cellular, Wi-Fi, and emergency services. These types of antennas are typically designed for DAS installations where ferrous metal structures, metal building materials, and relatively high transmit power is needed to accommodate complex geometries of internal building and underground structures.